Cindy Runs: Ich Bin Ein Berliner! My earliest childhood memory is dancing in our apartment in Queens, NY to Chubby Checker on TV while he was singing “The Twist”. About 50 years later, I heard Chubby Checker’s voice again, urging us all to “Twist Again”, blaring out from the loudspeaker at the water stop at mile 11.24 during the Berlin Marathon. As I sipped my water, I couldn’t help myself – I danced the twist again for a few seconds, then threw my paper cup down and ran back into the street. If I could have danced the rest of the 26.2 miles I would have. It was that great of a race, a weekend, an experience. 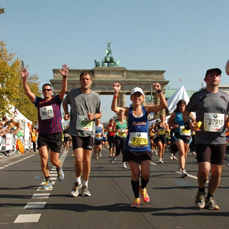 The Berlin Marathon is one of the Five World Marathon Majors. After running two of the Majors, NYC and Boston, I thought it would be cool to complete all five, the others being Chicago and London. I also thought it was an original idea for a non-professional athlete. When I arrived at the Welcome Cocktail Party for the group of North American runners with the group from Marathon Tours and Travel at the 5 star Concorde Hotel in Berlin, Germany, I met 99 other non-professional runners with exactly the same idea. 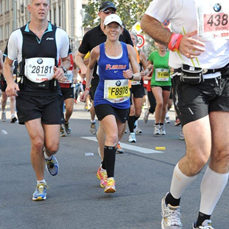 Everyone I met from our group was in Berlin to knock another Marathon Major off the list. I ran NYC and Boston with some of them, including this one guy, Tim. Tim, after hearing I was going to run London in April 2012, said “oh, I ran London this year, you’ll love it.” I said, “Wait, you just told me you ran Boston with me this year, London was the day before, you must have one of those dates wrong.” He smiled and said, “No, I’m right, I ran London, hopped a flight that evening to Boston, got in to Boston that evening, then ran the Boston Marathon the next day.” And he was typical of the people I met in the Marathon Tours group, they are uber runners! Most have run 10 or more marathons, some dozens, 30, 40... One guy, Dave, has run all 50 states at least once, 8 foreign countries, a total of 75 marathons. He had run the AF marathon the week before Berlin. John, a member of the Seven Continents Club answered my question about the Antarctica Marathon: “Not that cold, temperature in the 30’s.” Another guy told me, “Since I’m already in Europe, I’ll run Berlin tomorrow, then Budapest next week and Istanbul the following week.” And then there was Henry. 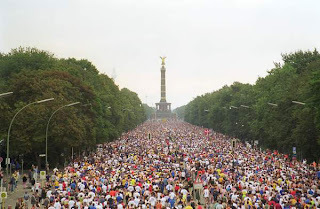 He is 62 years old, and Berlin was his 751st marathon!!! That is, as he said, “If you also count the ultras.” I said, “Oh yes, we will also count the ultras.” It was so cool to spend the weekend with people who were as passionate – some might say as crazy - about running as I am. Here I am with Henry - right before he ran his 751st marathon! Before I hooked up with the group, I had a day of running and sightseeing on my own. Although the hotel provided me with a map of the area, I found it hard to follow, since many of the streets were blocked off. I figured the city was getting ready for the marathon a few days early, but there was another reason. After finishing my run, as is my custom when running in a foreign country by myself, I got horribly lost. I asked a cop for help, and then noticed there were hundreds of cops and police cars lined up and down the street where I wound up. “What is going on here?” I asked. The policeman answered, “The Pope is coming here any minute.” So I waited around and got to see the Pope arrive in his motorcade! And not only did I get to see a world religious leader, but Germany’s leader as well. During the half day city tour Marathon Tour representatives Jacqui and Kelly organized for us, our bus went by Germany’s version of the White House where Chancellor Angela Merkel was holding a press conference on her balcony and I got to see that too! Our city tour was highlighted by our 50 year old tour guide, who personalized Germany’s recent history for us when she explained that the Berlin Wall went up the year she was born (her grandmother was living on the east side of the Wall so was separated from the rest of the family for 28 years) and the wall came down in 1989, the year her son was born, so although his parents and grandparents had the Wall play a significant part in their lives, he has no recollection of that great divide in the country. It was very sobering for us to hear personal stories of the time Germany was divided in two. We all posed in front of the Berlin Wall and snapped photos at Checkpoint Charlie – for the price of two Euros. Berlin does not hide its past during World War II from the current residents or from visitors. 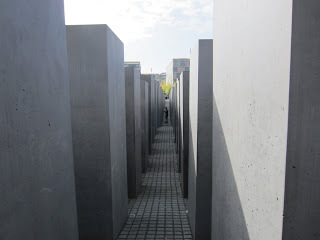 In fact, the Holocaust is front and center in many places in Berlin, as if by highlighting the horrors of what happened so many years ago, everyone is educated about the evil and it can never happen again. 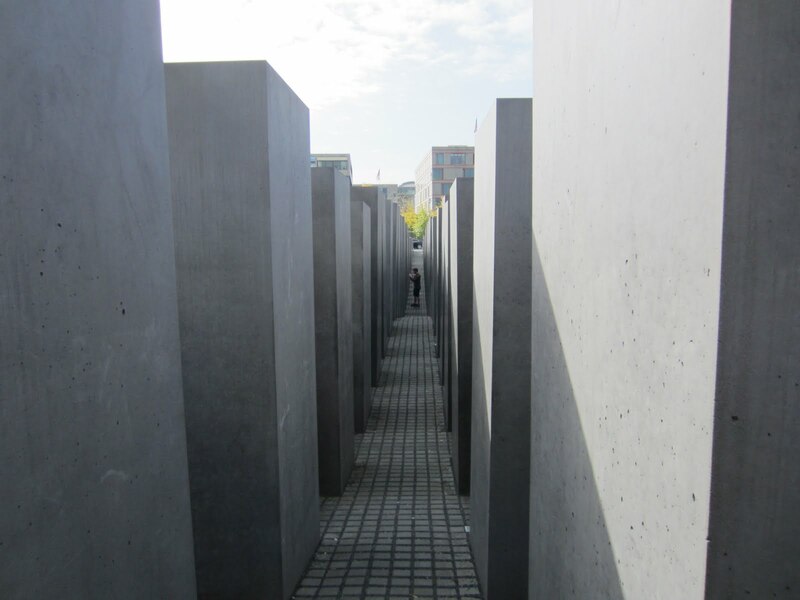 On our city tour, we toured the Holocaust memorial, a walk through and around multi slab sculpture that is on uneven sloping ground that keeps the observer off balance and wondering what will happen next. Many places throughout Berlin have plaques on the streets, naming and memorializing Jewish families who lived in the building in front of the plaque who were taken away to die in concentration camps. On my own, I visited the Jewish Museum of Berlin. The building itself is an architectural marvel – one of the American students I met on the way there had learned about the museum in her archicture class, since it was designed as both a traditional museum but also had a section similar in theory to the Holocaust Memorial, all uneven ground and walls, as if one never knew what was waiting around the next corner. The museum was in part a celebration of Jewish life since the 1200’s in Germany – I loved seeing the pictures and artifacts of Jewish life through the centuries, from clothing and furniture to paintings, religious symbols and articles and pictures of holiday and life cycle celebrations, to home movies of a happy family on a ski trip. But it was also a walk through centuries of discrimination and persecution, including many photographs of the Holocaust. I was glad to see so many people at the museum, including hundreds of German school kids. Those who are now in power in Germany want everyone to know what happened to their own people and want everyone to know the dangers of their past. I was proud of the modern day Germans and their approach to the Holocaust. 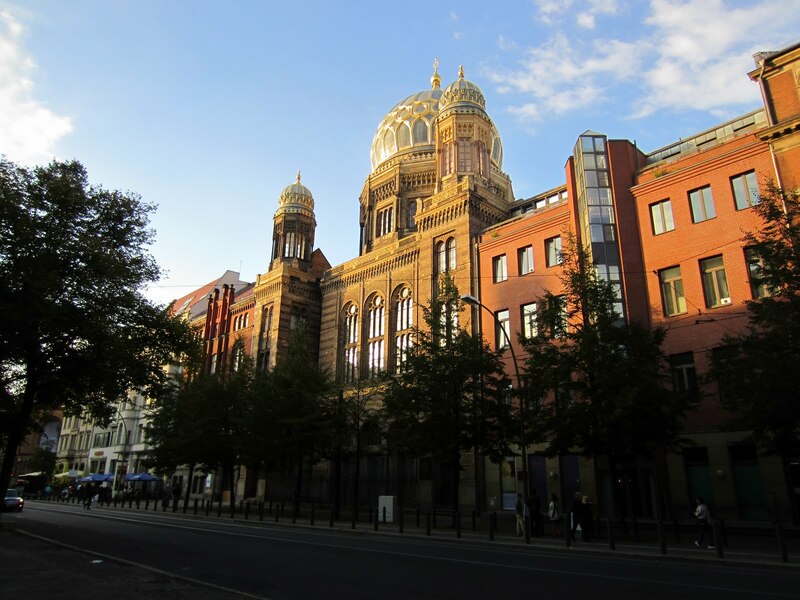 I also attended Friday night services at the New Synagogue, once Germany’s largest temple, the heart of Berlin’s Jewish Community. I had written to them in advance, asking to tour their historical temple, and was invited to worship with them on Friday night. In the email, the secretary told me there would be heavy security and I should be prepared to answer questions as to why I wanted in to the building. I arrived early, partly because I didn’t want to be late, but also because I wanted to catch a glimpse and hopefully shoot a picture right before sunset of the dome of the synagogue illuminated by the sun’s golden rays. My guidebook informed me this was a must see in the city. I was lucky enough to witness this beautiful sight and snap a few photos. Before I entered the building, history was brought back home to me by a plaque in front of the temple which told of how the temple was burned on November 9, 1938, Kristallnacht, when synagogues all over Germany were burned. There were two armed police men in front of the main entrance, which led me inside, where a scanner like you see in airports was in the lobby. As I put my purse through the scanner, a man was waiting to speak to me. I started talking fast, explaining why I was there, where I came from, and the email I received from the temple. I guess I was a bit freaked out by all the security for a simple Friday night service. When I was done talking, he smiled, looked at me, and said one word: “Shalom”. I smiled, and it was as if everything else melted away. I walked into the sanctuary, and I could have been anywhere, at any other temple in the world. The service itself was all in Hebrew, lots of singing, led by a woman rabbi and a woman cantor. The 100 worshippers ranged in age from a 3 month old baby to a gentleman who must have been in his mid-eighties. The rabbi’s sermon was in German, but there were a few remarks in English to several of us English speakers. Afterwards I spoke with the rabbi and cantor, and several of the people in the audience who spoke English – a college student from Australia, a 30 something guy working in Germany for a year who was from Florida, another American about my age who moved “home” to Germany, the country where his mother had been born. Everyone was so friendly, and wished me luck in the marathon. 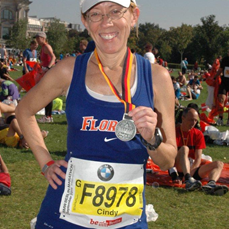 There was so much to see and do in Berlin I almost forgot I was there to run a race! I spent Saturday touring the Berlin Zoo, a very cool world class zoo with the most amount of species of any zoo in the world. 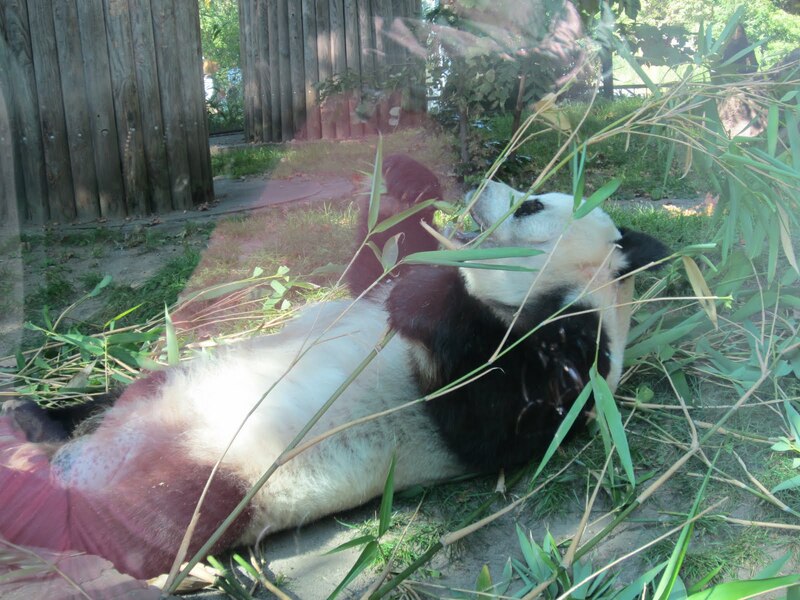 I didn’t want to miss anything – from the elephants and monkeys to the panda bear and rhinos. I also enjoyed people watching on that sunny warm day, trying to guess which of the people might be running the marathon the next night. That night at dinner, our group got together again for a pasta dinner organized by Jacqui and Kelly from Marathon Tours, to carb load and regale each other with stories of marathons past and our hopes for the next day. “Weather looks great,” I heard more than once, as people kept checking the latest weather report. At 7:45 AM the bus took our group to the start of the race. The only complaint any of us had about the marathon was that there were only two port a potties at the start. “2 bathrooms for 40,000 of us?” an English woman said to me as we all stood in line. Always the optimist, I tried to spin this around to, “well, that’s one for 20,000!” She just glared at me, like it was my fault there weren’t more bathrooms. The runners too were entertaining. Many were wearing traditional costumes in this international marathon¸ such as the woman in the Hawaiian skirt and the Scottish man in the kilt. The back of one runner’s shirt said: “ Haile, keep up with me, Paula, keep following me”. And did the Queen of Denmark tell all her people to run or watch the Berlin Marathon? The Danes were out in full force on Sunday, hundreds running with identical Danish running outfits, and the spectators literally waving the Danish flag all over the streets of Berlin. There were runners from all over the world, but most visible, after the Danes, were the Japanese, and not only their fans on the sidelines held the Japanese flag but several runners as well ran with the flag of Japan for the entire 26.2 miles. They were there, inspiring us, strong and proud, representing Japan after the recent disasters that hit their country. We ran with champions. The two current world record holders, Haile Gebresalaisse and Paula Radcliffe, started the marathon and were favored to win. Haile had to pull out of the race about 2/3 of the way through, due to exercise induced asthma. Paula, at 37 years old and a mother of two young children, came in third place and is expected to use this standing to make the British Marathon Olympic team. 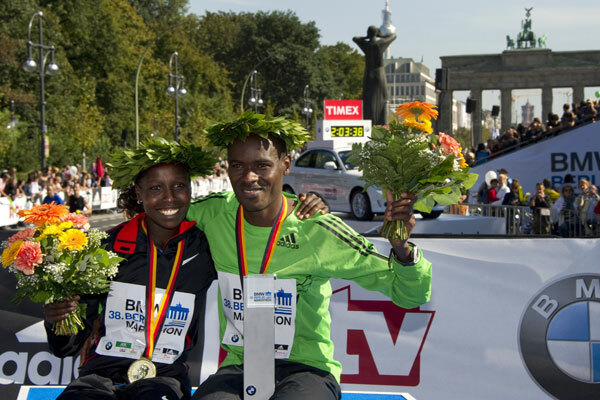 The race was won by two Kenyans – Florence Kiplagat, in 2:19:44, and a new world record was set by Patrick Makau in 2:03:38. My friend’s husband who was watching the race said that the bicyclists hired to ride with the elite runners had trouble keeping up with Patrick’s 4:43 average minute miles. As I ran through the Brandenburg Gates, just a few yards or meters from the finish line (by that point I had stopped doing the math in my head, trying to calculate how many miles or kilometers I had left, when the next water stop would be in miles or kilometers, whichever unit of measurement sounded easier to my tired body) I smiled for the cameras and realized there will never be another marathon like Berlin. And it wasn’t just the celeb connections, from the Pope to Chancellor Merkel to running the same course at the same time with some of the greatest runners in marathon history. It was the people I met on this journey, from Jacqui and Kelly, the amazing and efficient leaders of our group, to every accomplished and interesting runner from Marathon Tours, to every single German person I met that weekend, all incredibly helpful and nice and cheerful, that made this trip phenomenal for me. As I crossed the finish line, automatically stopping and checking my watch for my time, I missed everything about Berlin already. I hope there will be many more marathons in my future, but there can never be one that touched my heart and my soul as did Berlin. I'm so glad you got to see all those things and see what a great place Germany is these days.